This is the third of my posts about some of the places I visited in North Wales the week before last. The first was about the beautiful Bodnant Gardens and the second about Conwy Castle, one of the three different castles we went to see. Today’s post is about Caenarfon Castle along the coast to the south-west of Conwy. 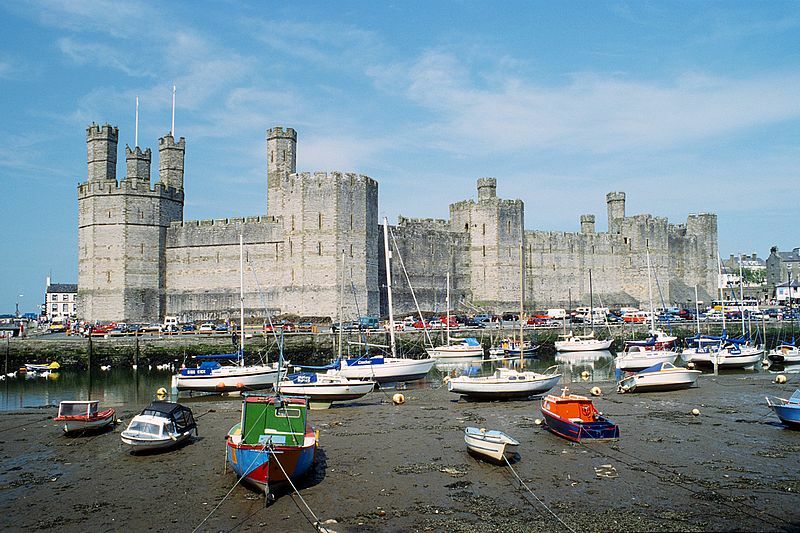 Caernarfon was one of a series of castles built by King Edward I of England after the second Welsh war of independence in 1282. Building began in 1283 and the castle became his royal palace-fortress instead of the originally intended castle at Conwy. For the Welsh, Caernarfon was already an important and mythical place. The Romans built a fortress here (Segontium) in AD 77 and legend holds that a Roman emperor called Macsen Wledig (Magnus Maximus) married a local princess. It is thought that this link with the powerful Romans was the reason why Edward I chose Caernarfon as his royal ‘capital’ and had it built with colour-banded walls, emulating the walls of Roman cities and perhaps even Constantinople itself. Following the Norman Conquest of England in 1066, a motte and bailey castle was built close to the site where the Edwardian castle would one day stand. Many of these early castles were erected quickly, all over England, generally constructed of wood at first and replaced by stone some time later. Motte means ‘mound’, which could have been a natural one, or one raised specifically for the purpose of supporting the keep, or fortified tower. Below the motte would be the bailey (an enclosure or courtyard) in which the kitchens, stables and storehouses would be situated. Here is an examples of an English motte and bailey castle, just to show what they looked like. Note, this is not the one at Caernarfon. There is little evidence of that left. It is thought that the motte of the Norman castle at Caernarfon was incorporated into Edward I’s castle, although the location of the bailey is uncertain. 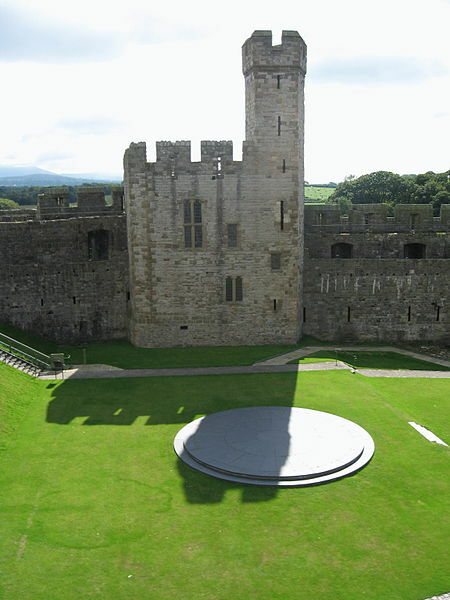 The design of Caernarfon Castle is rather like the number 8 – it’s been described as having and hour-glass shape (plan below). The coloured banding of the stone and the octagonal towers make it an impressive site from a distance, especially viewed from the Menai Strait. Unfortunately, it was a grey and miserable day when we went to Caernafon, so the castle has a particularly dark and menacing appearance. The main entrance shown in one of these photos is the King’s Gate. The Queen’s Tower (C on the plan) and two floor of the Chamberlain’s Tower (H) now house the regimental museum of the Royal Welsh Fusiliers. Through the walls from one tower to the other are lots of information panels. We didn’t go into this area on this occasion, but for anyone interested in mlitary history it’s worth a visit. 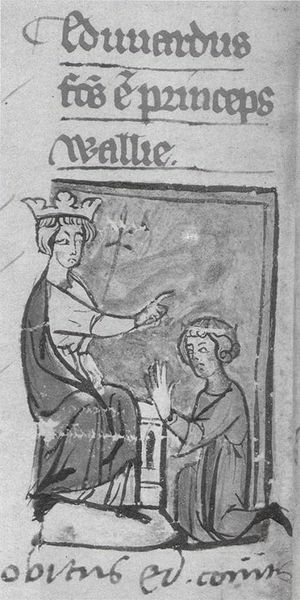 For two centiuries after Edward’s time, his arrangements for the governing of Wales still held. 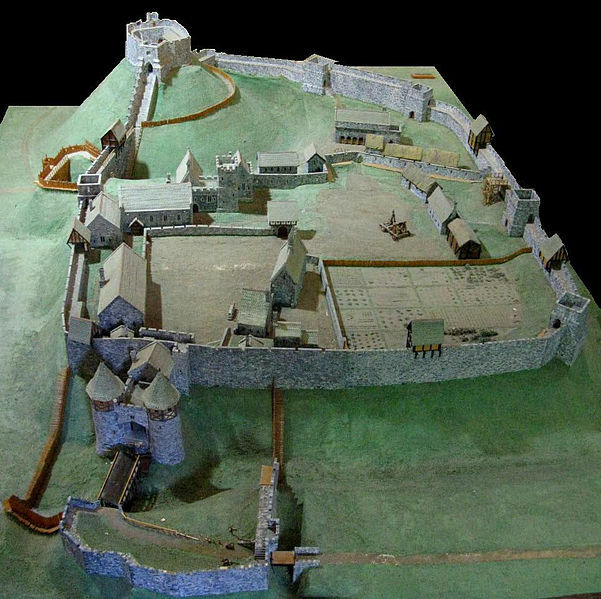 There were periodic revolts, as the one in 1400-15 when the castle was besieged by the Welsh supported by the French. The ascension of the Tudors, who were Welsh, eased hostilities between England and Wales and castles became less important. The Tudors changed the way that Wales was governed and castles became neglected. Many fell into decay. Although Caernarfon’s walls remained in good condition, the roofs and much of the timber rotted. Domestic buildings were stripped of anything of value (e.g. glass and iron) but the castle was in good enough condition to be garrisoned by Royalists troops during the civil war of 1642-49. As with Conwy, there is so much that could be said about this castle. But enough is enough for one post. Next My Internet Got Up and Went! Very interesting indeed. History is a wonderful thing and sites like these should be treasured for generations to come. The UK has such a rich past, and I thanks to your posts, I can add another piece of it to my memory bank. Thank you, Francesca. I find all castles fantastic places, as well as so many other types of historic sites. There are some wonderful long and round barrow sites that really amazing. I might be posting about those some time. Have you ever been to Wayland’s Smithy? I’ve already got lots of photos of that. It’s in Oxfordshire, close to where we once lived for six years. You’re welcome, and I do not think I have, but I probably will one day. Great photos! I love old castles. I like imagining people from hundreds of years ago going about their business as I look around. I agree. They really get the imagination going as you walk round. Warwick’s a great castle. It has a lot of things going on for tourists and school parties (the latter being why I’ve been so many times! Our classes had to do a study of how it would have been attacked and defended.) Thanks Ali. Absolutely wonderful Millie…loved the castle and the info. Oh, how I’d love a turreted home–just not this one. Looks like it may have been built by novices. The choice of building on quicksand proves the point. Still, some rock star may be interested in such a property. I wouldn’t like to live in this one, either (or any castle, come to that). 🙂 Just think of all the housework to keep it clean and tidy. A rock star could probably afford to have a new roof put on in certain parts, too. Thanks, Prospero. Wow, these are truly amazing photos. The castle is fantastic! I have never visited Wales, so it’s lovely to see photos and such captivating historical writing about the areas. A wonderful post. There are so many great castles all over Britain, but Wales has some excellent ones. There are lots more beside the three we visited two weeks ago. There are some great ones in South Wales, too, which are a bit closer to you. Thanks for liking my post! It’s very much appreciated. Aw you’re so welcome, Millie. Thank you so much too. I am very paranoid that I only post every few weeks, and I must get into posting new flash fiction! 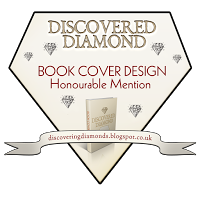 The trouble lately is that I am constantly weighing up whether a story should be posted or held back for a future ebook collection which I one day want to achieve as well as a first novel. Well done for writing whilst your internet was down – great work 🙂 speak soon. Fabulous and informative post. My constant craving to visit castles and explore every little detail is momentarily sated. Also, calling the shape of the castle “hour-lass” is my favorite “accidentally meaningful typo” of the week. Oops! Did I do that? I’d better hop over and edit! I’m glad you’ve told m. I must warn you that making typos is a favourite pastime of mine. Feel free to let me know any time you spot any! Thanks, Joy.